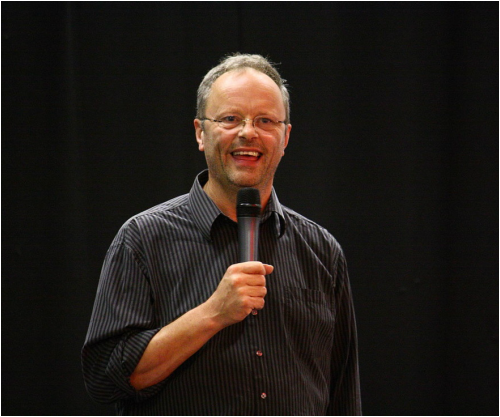 Using his great expertise from over the years, his skills in public speaking and his confidence from being an actor and comedian, Robert Llewellyn is a fantastic spokesperson, with a positive attitude and plenty of advice to give. Below is an example of an interview he recorded with the BBC about cleaning your PC drive and tips on how to help it run faster. If you're interested in a TV personality spokesperson for any radio or TV interviews please get in contact with us. Robert Llewellyn (born 10 March 1956, in Northampton, Northamptonshire) is an English actor, comedian and writer best known as the mechanoid Kryten in the hit TV sci-fi sitcom Red Dwarf and as a presenter of the TV engineering gameshow Scrapheap Challenge. He is a science and technology enthusiast, a promoter of renewable technologiesand electric cars and an atheist and skeptic who frequently gives talks at science and technology events.He is also active online. Llewellyn joined the cast of Red Dwarf in 1989 in series 3 and has continued in the role up to 2012's tenth series. In May 2015, it was announced that he would, again, be returning to Red Dwarf for the eleventh and twelfth series. His skills as a physical performer encouraged Rob Grant and Doug Naylor to write him additional characters for the series, namely Jim Reaper ("The Last Day"), The Data Doctor ("Back in the Red"), Human Kryten ("DNA"), Bongo ("Dimension Jump") and Able ("Beyond A Joke"). Llewellyn co-wrote the Red Dwarf Series VII episode "Beyond A Joke" with Doug Naylor. In the early days of Red Dwarf he would arrive to do makeup many hours before the rest of the actors, however that changed as time progressed as his fellow actors "have a little bit more help in the make-up department than they used to". In an interview with The Skeptic Zone, Llewellyn mentioned that he needs a special pair of glasses to be able to read the script with the Kryten mask on. In Red Dwarf, he worked hard to get the more technically difficult lines right because the show tried to be factually accurate in reference to scientific theories. He was also the only British cast member originally to participate in the American version of Red Dwarf, though other actors such as Craig Charles and Chris Barriewere also approached to reprise their roles.